Oh Where Art Thou Mentor? Dr Zoe Williams is someone who I have known for many years. Although to many she is a TV doctor, to me she is Zoe, an inspiration and someone who I have been in of awe of up close and from afar. She is passionate, efficient and driven. Watching her wear her many professional and personal hats inspired me to be more involved in the industry outside the confines of the 9-5. Although I consider her a mentor, we have never sat down for a mentoring session. Which brings me to the focus of this post, the dynamics of mentoring. In Part 3 of Broke Girls Guide, Sam Hodges recommended getting a mentor, but was also honest in adding that it is not always easy. Women in PR’s mentoring scheme 2019/2020 is now openly seeking to match 15 women in PR with senior women in their network, and I recommend applying. However, demand and availability are unmatched, and there are always going to be those left out in the cold. On the flipside, many will not be able to access these scheme because of various reasons, which are outside the control of the networks who endeavour to do their best. We all have a part to play in nurturing the next generation and ensuring that our leadership is equipped for the future despite what our niche, roles, or sectors. So I have chosen five questions that I have been asked repeatedly over the last decade. I have so many issues it would be wrong to dump that on one person. What should I do? “It takes a village.” This is where you need to adopt the community model. This can affect senior leaders who often can’t be seen to be asking for help because they are expected to have all the answers, which in of itself is a toxic way of looking at leadership. But it can apply to any professional who finds themselves spinning many plates and needs some solutions or help make tough decisions. In my experience, you need to either find a community of peers who will be able to share the burden and provide advice or select different individuals to support you. Imagine designing a list of your own Tribe of Mentors like the Tim Ferris book prescribes, only a condensed version that is tailored for you. Identify the issues that you are struggling with so that you find the right people. For example is it leadership, budget management, work-life balance, conflict, confidence, a skill gap or Imposter syndrome. From there you now have an idea of what the issue is, now you can start to identify people who can help. This can be done via social media, through recommendations, looking at who is talking about what, and please don’t limit yourself to the region or specialism. We are now more connected than ever, so a professional in Wales or Sydney is only a phone call, text or email away. If you find that your issues are not isolated to PR or communications why not try leaders in other industries such as human resource, finance, IT, sport and education. Some of these spaces are the IC Crowd on Twitter and The Comms Headspace on Facebook. There are no mentors that look like me or understand my struggles. In February I wrote a blog post for Comms2Point0, titled “We need more Ellens” because as a BAME practitioner I can not in good conscience make the promise to anyone that you will find a mentor who looks like you in our industry today. BME pros recently concluded their selection process for mentors, and I understand the challenges they face. According to the LGA Head of Communications survey, 2018 figures show that from 116 respondents not a single one was of African / Caribbean background and only one respondent was from an Indian origin. The PRCA Annual report 2018 data revealed that only 2% of respondents identify as Black / Black British and 3% Asian / Asian British. I must note that the LGA sample was senior leadership while the PRCA had respondents from other levels and includes the private sector, so this is of it ‘self raises more issues and questions. That is why the entire industry has a role to play. BAME professionals who sit on the sidelines and watch need to come forward and play an active role in inspiring the future generation. We should collectively use our influence in whatever capacity to pave the way for initiatives and be ambassadors for the excellent work being done. The leaders in our profession need to step up and listen more. We can longer leave it to the few such as The Taylor Bennett Foundation , Creative Equals, and BME Pros because we all have to play a role. If you are struggling to find a mentor who you are more comfortable speaking to reach out online or at events to practitioners. Speak to the other industry professionals regardless of their ethnic background because they will be able to recommend someone in their network or ask. I am hopeless at networking and am not part of the clique so how do I find a mentor? Yes it seems like everyone knows everyone and we spend our evenings sipping cocktails at networking events together, posting snaps in Instagram with the caption #SquadGoals, but the reality is entirely different. Many of the relationships seen online in my experience are either a continuation of an ongoing friendship that started with a nervous “hi" in person, a working relationship or an ongoing online dialogue that began during a Twitter Chat or a thread. There is a place for the introvert and extrovert in PR and networking is not exclusively for the ones with all the confidence. If you struggle with walking up to people at events and asking them for a coffee, ask the organisers or host, as they will be able to identify people for you to connect with. If you read an interesting article or blog post maybe send an email to the author and ask them a few questions. Try asking people if they are free for a phone call to build up your connection, reach out to the professional bodies such as the CIPR, Women in PR, the PRCA, The GCS and the IOIC for recommendations or if you are a member ask what the mentoring scheme is. Build gradual relationships with people, and eventually, you know when it is right to take the mentoring to the next level. People ultimately connect with people, so be authentic. I have a mentor, but they are too busy for me, what do I do? While I prefer monogamy in the more intimate relationships of my life, this is one where I would be more than happy for a mentee or mentor to see other people. Life experiences, career progression and personalities are so unique that you often learn different things from different people or connect better with someone else. If your dedicated mentor is busy try and seek out others in the industry that are able to help you. We live multi-dimensional lives and so being respectful of each other sometimes means having a mutual understanding that sometimes you will have to seek solace in another. A personal example is a colleague whose mentor is a senior professional, so he comes to me more often but goes to the senior leader for more significant decisions and this dynamic works for everyone. Don’t worry about asking for support from new people and a good mentor will understand that you are a period where you need more support that they may not be in the best position to provide at that time. Discovered by C.E.O Jack Welch reverse mentoring, takes the idea of traditional mentoring – which we known to be a 'younger', less experienced professional being taken under the wing of a wiser more experienced leader and flips it on its head. Reverse mentoring is rooted in the principle that senior leaders are looking for new perspectives, a better understanding of younger and more diverse professionals. Entrepreneur Holly Tucker, hosted Founder of the Dots Pip Jamieson on her podcast Conversations of Inspiration where Pip talked about the reverse mentoring that she is doing with VC’s around issues of gender. While at the European Union I was asked by senior politicians to do a reverse mentoring session and it was beneficial to both parties. KPMG, Virgin, The Civil Service, and FTSE 250 corporations have begun adopting reverse mentoring as part of the Internal communications and human resource strategies since its inception in 2016. They have reported that reverse mentoring has helped them in increasing retention of millennials, enabled them to keep up with technology and improved diversity and inclusion. Although this post isn’t an answer or solution to all the problems, I hope it provides a starting point for someone who has similar questions. Rugby has been a part of my life since I was about 15 years old. I have seen friends break bones, shared pints with legends and never had anyone mansplain the offside rule to me. I try to reserve spamming my social media timelines for the World Cup season, so feel free to mute me in September. However, last Saturday I broke this self-imposed rule because the Calcutta Cup showdown between England and Scotland was spectacular. In his post-match interview, Scotland's Finn Russell said in a BBC interview, “At half-time, I had an argument with Gregor [Townsend] because nothing was working. We just came out in the second half with nothing to lose”. I think of how Scotland lost to Australia in the final minutes of the 2015 quarterfinals and wonder if this is a team that plays best when they decide they have nothing to lose? And what springs to mind is a caution I was once given along the lines of; the most dangerous opponent is the one who has nothing to lose. So, for this post, I am drawing inspiration from a quote from Steve Hansen, the Head coach of the All Blacks and have asked for some tips, hints and advice from our incredible Comms network. Look outside: Take advantage of our wealthier cousins advertising, marketing and tech. It may sound strange but an actual past time of mine is to get lost in the ‘Our Work ‘page of agencies. Last year during London Tech Week, I went for a few of the free or low-cost evening events and learnt so much. I will be keeping my eye on Ad Week to see what themes, conversations, and trends emerge. You don't have to go to Cannes Lions Festival to see what the best in the Ad world are doing watch the best of 2018 online for inspiration and check out the website to see what is coming through this June. In January Darren Caveney, arranged an agency day for the LGComms Future leaders and summarised it in a post be fierce and never mediocre – 28 lessons from a top creative agency. You will find that there is a lot of crossovers. Brand guru James Kerr wrote one of my favourite business books which is inspired by the All Blacks but is drenched in employee engagement tips, strategy and communications principles. Go further afield for learning whether that be in terms of industry or location. Draw inspiration from across the ponds. What behavioural science, strategy or creative ideas can we learn from sports, psychology, business, entertainment and the military. Collaboration: It may be the new buzz word, but it rings true. Come together with others and form communities that are built with the goal or learning, sharing and developing each other. Start a culture in your organisation and beyond of sharing the knowledge from training, conferences, events and campaigns. Why not invite someone for lunch with your team or set-up a group call to work out a problem together. Face to face events have a cost attached to them, but many professionals are happy to spare a lunch hour or evening to have a chat about ideas. Over the last few months, I have organised quite a number of these sessions over the phone with senior people talking about a range of things from Artificial Intelligence, development courses, job interview prep and idea development. Even if you don’t have anyone to share with yet start building a collection, so you are ready as you look for your tribe. Whatever one colleague gains bring it back to the team. In other words, share the learning around so the team and the organisation benefit. That’s definitely the main one. If you’re a larger team and need some core skills, consider commissioning a bespoke version of a set piece for your whole team. It is good for team dynamics as well as learning. I’d say be selective about it if budgets are tight. What are you entitled to: Understand your organisation's policy on training, development and allowances for registrations to professional bodies. Get savvy on what you qualify for and how you can ensure you get what you need, i.e. does it need to be in your appraisal or are you entitled because of your role or because of the business your organisation is. If you can register with a professional body make all effort to do the CPD, be on committee’s if you can to network and ask questions. Say Yes: One yes has the power to change everything. It can be hard in the beginning, but it creates a domino effect. One ‘Yes’ changes everything as Josephine Graham shared in her blog post, “What if…. ?“ for Comms Unplugged. — Ella Minty Co-Chair @CIPR_UK Energy Leadership Platform; Chart. PR; @ILM_UK Fellow; #powerandinfluence founder. Mark your own work: I know it sounds brutal but at the end of match teams and players do a de-brief so that they work on their weak area for the next game. Create a benchmark by which you score your campaigns and content. Whether that be the OASIS model or by industry awards standards. From that identify the areas where you need to grow. For example, measurement of campaign objectives, or public speaking skills. If you are at a higher level why not start judging awards so you can get a better understanding of what is happening in the industry. — Sally Northeast, 1/3 of Comms Unplugged and the Deputy Director for OD, Communication and Participation at Dorset HealthCare University NHS Foundation Trust . Find the gap and sidestep: What are the unexplored ideas, the unwritten stories and the unanswered questions that you can hone in on? A perfect example of this is the informative blog post by Lisa Potter, "Learning on The Go Making time to learn new things." in which she provides her perspective and fills a gap in content. Another is Comms Hero who are giving me so much FOMO at the moment with their exciting and fun conferences. I really hope this series has been helpful and please leave your comments below or share on Linkedin and Twitter. My vision for this space was that it be a place of experimenting and learning, so posts like this are special. Some starter Newsletter to subscribe or websites to check out. It took place on May 2, 2015, at the MGM Grand Garden Arena in Las Vegas, Nevada. The Floyd Mayweather Jr. vs Manny Pacquiao, fight. I know that fact. I was the only one on the table which included men that knew the answer. Seems irreverent, a by the way fact maybe. But at that moment I recalled all the times I refused to take part in quizzes because I thought I had nothing to add and was rubbish at them. But on Monday I thought let me give this a try, and I contributed. Nobody had ever told me I couldn’t be a part of a quiz I discounted myself. So my commitment this International Women’s Day is to give myself a chance. I am particularly obsessed with gifs and where possible I try to use one that represents women or people of colour. This week, Josephine Graham, penned a fascinating blog for Comms2Point0, one small step for womankind – support a new movement through your choice of gifs, which is a must read. It is a reminder to speak up when you notice something and the importance of using your voice where you are. In that spirit, I assembled a panel of very diverse women this week for a peer-peer conversation on a career in communications, digital marketing and technology. I promised that it would be candid, and honest it was. It’s another example of getting out of my own way and moving forward with the dreams and aspirations that I have. The very inspiration Caitlin Moran, came to Sky this week and gave a funny talk. What stuck with me the most was that diversity is not a target. If you are going to do, then do it right at every level of the organisation, not wearing a moral badge of honour like you have done the world a favour by employing a woman. Also, scented candles are wasted on men. Please check out these incredible pieces. Comms Unplugged Tickets are now on sale, so hurry and grab yours. I for one will be at the communications event of the season. Saturday mornings are my favourite time of the week. Regardless of whether I am doing a spin class, grabbing brunch with a friend or having a lie in after one too many glasses of Merlot the night before in my very Olivia Pope wine glass. This one, however, has been the first one of the year that I am able to settle into myself because I have been consumed by the process of finding and starting a new job. Life inevitably keeps ticking over even if you have interviews to attend and presentations to nail the day job still needs to be done and to the highest standard. So this morning I said bye to my brother who has been over from San Francisco and decided to finally watch the Netflix docuseries The Defiant Ones and Fyre - The greatest party that never happened, which I highly recommend. But this week during #Powerandinfluence chat The Challenges of Public Sector Communications with Darren Caveney I promised that I would pen a broke comms girls guide to professional development and give an insight into what has helped me, so while I recover from the rugby let me start putting something together. If you take one thing away from this blog post, it is to have an idea of where you want to go with your career and take responsibility for making that happen. This is the first part, which is written for anyone who has zero budget to do anything. Have a plan: In the last few years I have begun to think much more critically, and one of the things that has helped me do this is the blueprint I designed for myself of what success looks like for me. In my case, it’s been an evolving piece of work, but I have a notebook that I regularly visit and brain dump my vision onto. I then map out how I am going to get there craving out a roadmap. That way my energy is channelled in the right direction and focussed. What problem are you trying to solve: Before you begin to think about what training and development you want to go on, start by mapping out what problem you are trying to solve for yourself and the organisation that you work for. There are many courses or books that I could pick, but I always ask how does this ultimately fit in strategically. For example, if you work in public sector communications, the biggest challenge in the sector is finding ways of making the communications function commercially viable and gaining real influence in the organisation, for someone with a digital role it is to prove the ROI of your online activities. One of the best pieces of advice I received going into my new position was, "understand why you have been hired, not what they want you to do but what problem are you there to solve from a strategic point of view". Stay curious: There is an abundance of resources to read, listen and watch online and I will list as many free ones as I can. But a lot of it comes down to mindset and attitude. In a recent podcast Russell Grossman, Director of Communications at ORR summed it up quite well. The future directors and heads of communications will need to have a 360 view of everything. Just being interested in one aspect of the industry will keep you boxed in. Read reports to understand insights, business books to develop a strategic view, listen to podcasts that give you perspectives of what other sectors, businesses and practitioners are doing, dive into the data and understand the trends. I often find some great inspiration in reading award submissions, case studies by creative agencies and watching documentaries about the industry. Ask for help and have questions: Social media has broken down a barrier that previously would have made it impossible to access certain C-Suite level individuals. At our fingertips, we now have some of the most influential people in the industry during a Twitter Chat or are able to send them a message via Linkedin without having to spend hours trying to figure out their company email which is probably bursting at the seams, so take advantage of this access. Having done all of the above you will know and understand much better what questions you are looking to get answers to. Never be ashamed or afraid to ask for help. While it may seem like there are people who know all there is to know about everything, we are all still learning with a child-like curiosity. Build your tribe: Mentors are great, and I would suggest having them. But build a network of people around you who have your back, are able to be brutally honest with you, and bring something different. I have people who keep me grounded and check me, the ones who encourage me when I am in a dark place, the ones who push me outside of my comfort zone, the ones who open me up to new experiences and the ones who guide me on what is next. The community I have chosen to build around myself is based on respect, care, loyalty, honesty and a vested interest in each other. Having a Rolodex of names will only take you so far as opposed to authentic friendships. Come with a clear agenda. What do I need to think about / do/ learn in the next 3 – 9 months so that I see the change in the next year? What projects do I need to take on that will take me to the next level? What skills do I need to start developing, professional and personal? Bring something to the table and show that you have made progress. There is probably nothing more frustrating than giving someone the same advice, steps and direction over and over again for them to ignore it but time and time again come back hoping you will have different advice. Pave it forward and be of service. Full list of podcasts I listen to visit. I have recently been asked a few times to update my book list. This is only about 7 months old so there will be many books missing as its not an extensive list of all the books I have read over the years. It is a possibility that the marketing team at Republic never sketched me out as a persona when they were curating Ariana Grande’s target customer but, I’m sold so that conversion was easy. There is a relief that comes over you when you see your flaws, victories and struggles in someone else’s story. I teared up when I heard Ariana’s acceptance speech at Billboard’s Women in Music Awards, so much of what she said resonated with me. People look at you and think, oh wow she has it all together, over there living her best life. But some of us are out in these streets singing Breathin and Thank You, Next. I’ve loved and lost romantically and professionally. Giving myself unconditionally often with an intense amount of sacrifice. I have worked hard on projects and had them quashed at the last minute with no explanation, but I have also been given awards for my work. I have an incredible media and public relations network that spans almost 10 years, and I have been the victim of the most horrific workplace bullying. I’ve fallen in love with a job only to be rejected at the final interview stage and had some incredible pinch yourself speechless, OMG moments over my career. Through each experience, I have learnt something different about myself as a person and a storyteller. The job where I was going through the motions taught me that there was something more for me, the global organisation reminded me that there is a big wide world full of opportunities, and the list goes on. So here I am in the limbo week dancing to Ariana in my pyjamas, which sums up quite well what this year has been about. Being re-introduced to Harriet, who she is and what she is really capable of, but also taking the time to concentrate on developing my career, courage and grabbing the opportunities that I’m given. I know that we all have to live our lives with a degree of caution but what is your Thank You, Next for 2018. That thing you’re grateful for teaching you a lesson, but it needs to stay in the past because you are on a new journey. For me, as a communications professional it is this notion that “we are just, comms”. We are an integral part of the business and if you empower or allow us to do our work we deliver and can support the company to solve problems where good communications are critical. So what is your professional or personal, Thank You, Next for 2018? If there were no restrictions on my life, self-imposed or otherwise what would I do? Since asking myself that question seven months ago, my life has changed in a way I struggle to put into words. While I am having one of the best years of my life with many un-forgetful moments. I am in the same breath being the bravest I have ever been, all because I question the barriers that have stopped me in the past. This change can be rooted in my choosing to ask of myself something different and challenging. I sat down in the café in Clapham and even though I was scared out of my mind, I took out that pen, and in that leather, notebook scripted the life I want, deserve and am going to hustle for. It frightened me, but I was the only who could change the blueprint. It was no longer enough to say I have goals. I had to use my imagination to design something that way beyond what I thought was possible. I changed the questions, I asked myself, the world, my industry and those closest to me. I’ve had to ask better questions. I’ve had to be courageous enough to seek answers. What is stopping me from being a great communications strategist? When am I going to create and execute an award-winning campaign? What is my story? What do I bring to the table that nobody else does? Deciding what kind of career I wanted as a communicator meant that I've had to analyse everything that I did. From which events I attended, books I read, courses I took, mentors I sought, projects I accepted, and my attitude towards work. A month ago, at Comms Unplugged, Sam Hodges, Head of Communications at Twitter UK, said something that cemented these thoughts for me. What skills do you need to be more strategic? For me, it means looking at the list and thinking, ah. How do I figure this out and start to develop in a particular area? But I have to be brave and think outside the box because there will be some skills that are just impossible to develop in my current role. How do I then find ways of improving them while still excelling in my current role? On this pursuit I came across Vishen Lakhiani and began to understand how he uses questions to explore goal setting. He essentailly asks three questions. I’ve found this really helpful. What experiences do I want to have? What contribution do I make to the world? I hope this helps someone who is thinking about change in any area. For 6 years Shonda Rhimes gave me a gift that I'm forever in her debt for. She dived into her imagination and brought to life, my hero. Olivia Pope is my mentor from afar. So when she strutted off down the mall I mourned. Despite her dysfunctional relationships and her flaws the career lessons, I drew from her have shaped me and given me an ambiton I never thought I would be brave enough to puruse. Olivia's break came when she worked as Fitz’s campaign manager a job she got because of her relationship with Cyrus and Verna. Your network is truly your net worth and the people you know give you access to closed doors people more talented can't even peek into. Get on apps like Meetup and Eventbrite, to find out where your industry events are. Use social media to create an enviable phonebook. Use LinkedIn to reach out to people. "I am many things, stupid is not one of them." Learn, read and then learn and read again. Practice and then learn again. I know it sounds harsh but the reality is hustle and hard work take you further. Ask better questions. You have to be twice as good as them to get half of what they have -Eli Pope. What has your gut told you lately? I recently turned a job with a prestigious charity because my gut feeling was off. Develop a way to listen to instincts and hone in on what your inner self is saying. Ultimately when you live by your resolve you will have much more peace. "My gut tells me everything I need to know." The balls on the gladiators was epic. The Mantras would leave you in awe. It oozed confidence. Walk into a room and have a presence with substance. Whether that means listening to a song or giving yourself a mental pep talk. Find your strength and breakdown those barriers in your mind. "Some people have bark, some people have bite. I have both." The partnership that had the biggest impact on me was with Lawyer Professor Annalise Keating. Olivia always came together and worked with other people whether it was for good or evil, collaboration was her thing. Despite being an incredible woman Olivia knew that a good team around her was her strength and she made sure her gladiators were taken care of, well sort of most of the time. If you can achieve your dreams alone then they aren't big enough. 6. Make it mean something. Wear your white hat, wave your freedom flag and wear your pink ribbon. Whatever your thing is let it mean something, volunteer, and if you are the world's busiest person donate. Live a good life, be kind to the planet and Give something back. Plant seeds in gardens you will never walk in or admire their flowers of. When Fitz and his press sectary were shot, Olivia stood up and addressed a press conference. She took on a role that wasn't hers. In fact, I’m struggling to think of a time when she failed to step up to the plate without waiting to be asked. Despite setting up Pope & Associates, very successfully I might add she left to work at the White House. The world we live in has changed, careers are winding roads and nothing is off limits. Don't be afraid to pivot, re-train, step out or start the side gig. In fact, if you look at the career path of all the gladiator's each one of them has had a stellar career. 9. 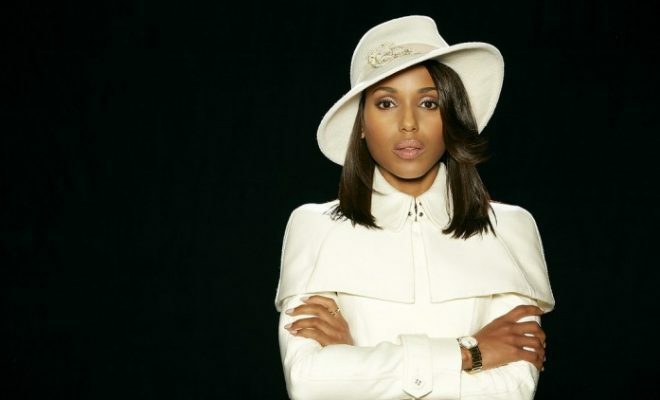 Be strategic Olivia Pope is one of the most effective communications professionals I've ever watched. She maximised the power of storytelling to get the message across, she knew her power to win elections and get laws changed. "I am very good at what I do. I am better at it than anyone else. And that is not arrogance that is a fact." Swimming laps, dancing or running whatever it was Olivia had a way to have fun zone out. We all need that time of reflection. 3 months ago I walked out of a 5-star London hotel a changed woman. Marie Claire Future Shapers Live was the crucial piece of the puzzle that I needed to add my jigsaw to bring my vision to life. Spending the day hearing from strong, creative, inspiring, courageous and industrious women made me not only see myself and my capabilities in a different way but it reignited the longing I’ve had to find my tribe. There are times when you think of an idea or a concept but wonder am I the only one who thinks like this? Is it just me who wants this? Are there other women who struggle with imposter syndrome the same way I do? Meeting women who have the same fears I do but have made it. Speaking to women who struggle with the same lack of resources or shortcomings that I do was empowering and it spurred me to change and execute. Not just talk about what I want to actually do but put in the work. I'm cultivating my 'why'. Aimee Bateman talked passionately about finding your driving force and hone in what motivates you. I am developing my personal brand in my industry and outside of it. I have a strategy for my social media, have identified what I want to be known for and am developing my USP. I am finding my courage by doing the things that scare me. Whether that be doing a public speaking event this summer to taking on projects at work that are outside my comfort zone to running a Twitter chat with communicate Magazine or creating this Comms Over Coffee which was an accident that came as result of doing something brave. Although I haven’t yet figured out what my side hustle is, I am open to the idea. I understand that there is a space for me to make money alongside my current job and that there is a freedom in experimenting with this. I have changed the way I network and am building my tribe. I give back to my industry and am actively putting myself in a position where I can find and build my tribe. I am harnessing my individuality and I know it is okay to be who I am because I have value to add being myself. I have taken my extreme curiosity and love for learning to the next level. Experimenting with content creation, exploring marketing concepts, diving deeper into digital media and reading books that I would never have considers in the past such as Seth Godin's The Icarus Deception. I need me time to think, reflect and rest. I will often go out to a coffee shop with a notebook and just write. I go for the Bruno Mars and Ed Sheeran gig because we all need to enjoy ourselves. I am in a privileged position. I have a responsibility to the generation behind me whether that be through my work or how I give back to leave the world a better place than what it is now. At first, I thought it was a fluke. That maybe if I did a few times over the results would change but no such luck. The 16 Personalities test results are in and they reveal my personality type is, 'The Protagonist ENFJ-A'. Sounds really interesting, doesn't it? I have the same trait as President Barrack Obama, Oprah and believe it or not Daenerys Targaryen. So what does this mean for me a communicator and public relations professional? ENFJs are natural-born leaders, full of passion and charisma. They are able to bring these ideas together and communicate them as a common goal with an eloquence that is nothing short of mesmerizing. It has helped me understand what my strengths are. I am tolerant, reliable, charismatic, altruistic and a natural leader. My careers choices are based on doing what I love, meaningful, creative and honest work. I am good at working independently and have a desire to learn and grow. The best part of the test is that my perfect professions were identified as Public relations specialist, consultant, editor, creative writer, web designer, public speaker, and an educationist. Going forward I will seek opportunities that allow me to maximize my strengths and develop my emotional intelligence. It takes less that 12 minutes to complete the test, that I can guardnetee you.